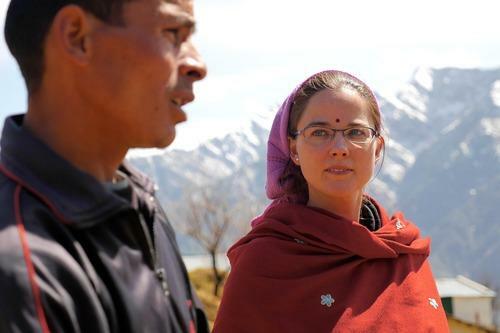 Social geographer Dr Jane Dyson has spent years living and working in a remote, high-altitude village. Now she is telling the story of its people through film. For my PhD research at the University of Cambridge, I worked in a high-altitude village in the Indian Himalayas for 15 months. I was examining children’s work and their contribution to rural livelihoods, but also looking at the ways in which work provided an opportunity for young people to develop their own cultural practices and relationships. The work has been ongoing since the early 2000s, and I am planning more field trips while working at the University of Melbourne. So I have been following the same cohort of young people as they grow up, watching as their lives are shaped by a changing world. While I work on a micro level, it enables me to build up a broader understanding of the dynamics of social change more regionally. My work involves a lot of participant observation and lots of manual labour. 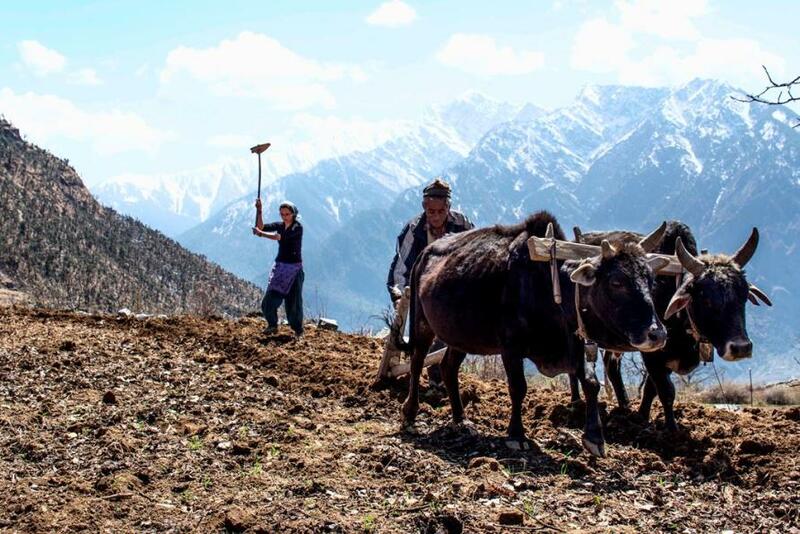 Villagers spend their days working the land; herding cows, weeding potatoes and harvesting wheat. There is little time to sit down and do formal interviews. I have to talk and learn on the go, working alongside villagers. I also spend time with people in their homes trying to understand a range of perspectives from children, their parents and grandparents. When I first arrived in the village I had to walk for half a day to get there. There was no electricity and no communications. But in the past five or six years, there have been all sorts of changes. There is now electricity, a mobile phone tower, the government has done a huge push on education, and there is a now bumpy dirt road that reaches right to the village. Villagers had to struggle and protest for each of these new structures, and it has changed the village dramatically . It has particularly influenced the generation of young people I have worked with. For example, while most people over the age of about 40 are illiterate, many young people have persuaded their parents to keep them in education. Many have finished high school, or have gone on to do BA degrees via correspondence. It has really changed the social landscape. Shifts in education and employment strategies have implications for marriage practises, they have changed farming practises and young peoples’ aspirations, and they have altered the relationship between generations. Older people find that they don’t have the relevant knowledge of new fields of employment or schooling, and it’s shifting the power dynamics between them and young people. Villagers were keen to get their story told. I return regularly to the village to continue the research, and, while I was publishing my academic work, that was meaningless to villagers. I felt a responsibility to tell their story to a wider audience, and film seemed a good way for villagers to narrate it themselves. The documentary is a portrait of a community seen through the eyes of one man. It is about a relatively remote community coming to grips with rapid social change. Nothing was scripted. The main character, Makar Singh, and I would just sit down, often at the edge of a field, and talk with the camera rolling. He would show us his house, the road or the telecommunications tower and he’d explain why it was important. It has become a fantastic teaching and policy tool. In India and internationally, the film has sparked interest among a range of policymakers eager for real-life stories to inform their decision-making. I have also worked closely with high school teachers to develop lesson plans that link in directly to the geography curriculum in the UK and US, and hopefully in Australia in the future. I couldn’t have made the movie if I hadn’t already worked for a decade in the village. I couldn’t have walked around with a camera; It hinged on people’s trust and their confidence in me. The movie is just one story that has come out of my research in the village. I’ve also spent lots of time talking about girls’ education, and about the politics of love and delaying the age of marriage. I’m interested in young people’s mental health, and the role of spirits or ghosts in this. I have had emails from people in parts of Russia or Japan or South America, saying “this is just like my village”. There are so many parallels all over the world today. Even in a big city in Australia we see young people struggling with the same issues of getting a good education, securing meaningful employment and finding decent housing. So while the documentary is about a remote village in the Himalayas, it is a story that can be understood much more broadly. And that was the key for getting it out . And why the villagers themselves wanted to get their story out there too. As told to Julia Cleghorn.